This is the chartered London bus!! – 8/6(Sat) Yukata Dress up Party! 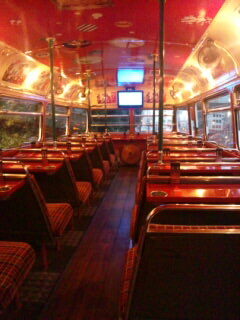 We will charter a London bus for the party on 8/6(Sat) 19:00 in Tokyo. The following is a special preview of the bus!! When you arrive the gathering spot, a double decker bus like this will be waiting for you. 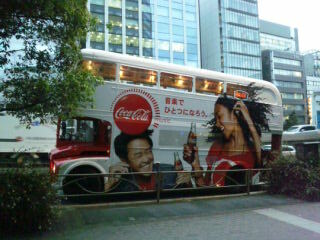 Passers look curiously and even some of them take photos because it’s still rare to see a double decker bus in Japan! Just a short note to remind you that you have your digital camera with you!! A photographer will be on the bus at the party. She’ll take photos of you one by one. Don’t forget to get all dress up! 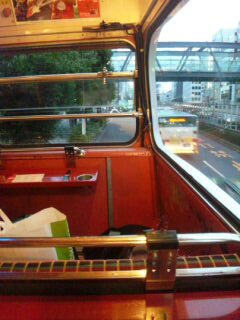 I have never been to London, and didn’t expect that I got on a London bus in Japan. Actually the bus was running in London so many years ago. If you have never either, why don’t you join our party!! Well, it’s time to climb aboard a bus! You have got a wonderful view from front bench! It changes your way of looking at things. The wind also feel great. It must raise your spirits!! ← Yukata Dress up Party on 8/6(Sat) 2011! !